Profile of the Buddha's face as in WD1759. 22 January 1790.
bl.uk > Online Gallery Home	> Online exhibitions	> Asia, Pacific and Africa Collections	> Profile of the Buddha's face as in WD1759. 22 January 1790. 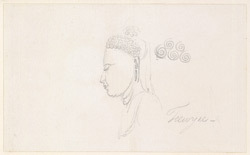 Pencil drawing of a Buddha sculpture by Thomas (1749-1840) and William (1769-1837) Daniell, dated 22 January 1790. Inscribed on front in pencil is: 'Teeunjee'. In his journal, on the 22 January 1790, William Daniell wrote, "From thence we rode to the Village of Tumyee where there is the Remains of a very large Statue of the Hindoo God Ram, his measure across the Shoulders was 2ft. 91/2in. the length of his head 161/2in. & supposing he was 7 heads high, his figure must have been abt. 9. 7. Near him stood Ram Lutchman his brother who was abt. 16in. high very prettily cut."